Recent military action in Gaza is starting to create considerable unease within Tory ranks, with one prominent pro-Israeli MP pressuring the government to alter its stance on the ongoing crisis due to the scale of Palestinian suffering. 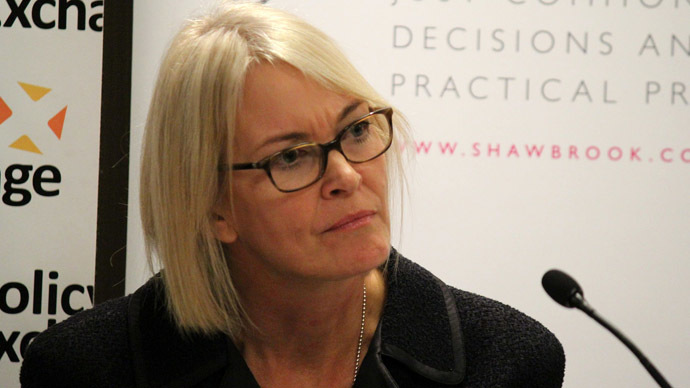 Conservative MP Margot James, an aide to former Foreign Secretary William Hague, has written to new Foreign Secretary Phillip Hammond, urging him to rethink the coalition’s policy towards the ongoing conflict. Observers say the letter is a clear sign of growing disquiet within the coalition government over Israel’s aggressive military campaign. Her constituents, mostly non-Muslims, regard Israel’s military action in the region as “wholly disproportionate to the threat posed by Hamas,” she said. Ms James unequivocally declared her support for Israel’s “right to security” and the ability for its citizens to “live without fear of bombardment.” But she argued that the rapid and reprehensible termination of “so many Palestinian lives, homes, hospitals and schools” cannot be considered in any form proportionate to the “crude rocket fire” to which Israelis are subjected. “I have visited the town of Sderot and understand, and sympathize with, the concerns, frustrations and fears, of an Israeli community living close to the border with Gaza. But the rockets fired by Hamas that I saw there are of an antiquated nature by comparison with the modern weaponry used by Israel to defend their civilians against such attacks. Attacks which are, in any case, rendered virtually victimless by the air missile defense system that Israel has in place,” she said. James also condemned the IDF’s recent shelling of a UN school that was operating as a shelter in Gaza, which resulted in 15 causalities. This attack marked “a new low in a conflict which has seen a truly terrible level of death and destruction in a very short space of time,” she said. Previously an advisor to trade minister Lord Livingston, Ms James has recently been appointed parliamentary private secretary to William Hague, the former Foreign Secretary, in his new role as Leader of the House of Commons. She recently traveled to Israel with a Conservative Party parliamentary group dedicated to strengthening cultural, political and business ties between the UK and Israel. In her letter, James acknowledged that Hamas has rejected several tentative offers to broker a ceasefire. But she also emphasized that Israel had categorically rejected US proposals which would have facilitated a ceasefire and potentially rekindled the peace process. She condemned Israel’s dismissal of recent US proposals for a peaceful solution to the Gaza conflict without “any debate whatsoever,” and expressed hope that a swift and peaceful solution to this “tragic conflict” would emerge. A temporary ceasefire was officially launched in Gaza at 8am local time on Friday, following Hamas and Israel’s agreement to halt the conflict for 72 hours. Brokered by the US and the UN, it was hoped the truce would allow humanitarian aid through to people in Gaza. It was also suggested that the ceasefire could provide time to initiate peace talks aimed at halting the conflict. But the short-lived truce came to a close approximately three hours after its inception. Although there was an initial lull in fighting, at least 40 Palestinians were killed as the IDF fired shells into eastern Rafah, according to local medics. 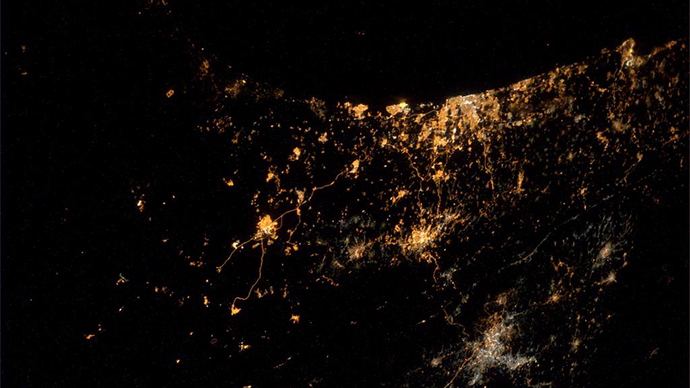 Rockets have also been reportedly fired from the territory. Public pressure on the British government has been growing in the wake of the IDF's military offensive in Gaza. 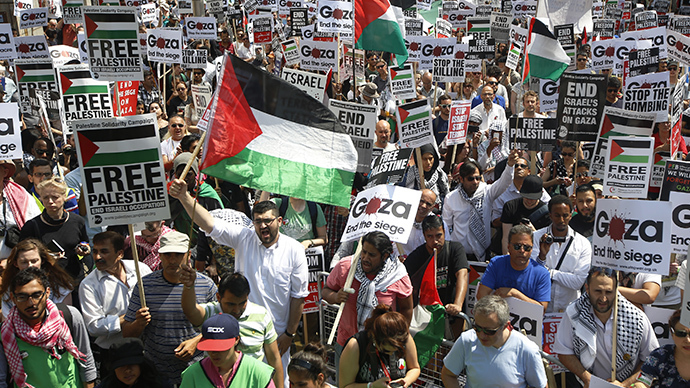 Thousands of British demonstrators have reportedly taken to the streets in myriad cities across Britain to protest against the Israel's on-going military campaign. 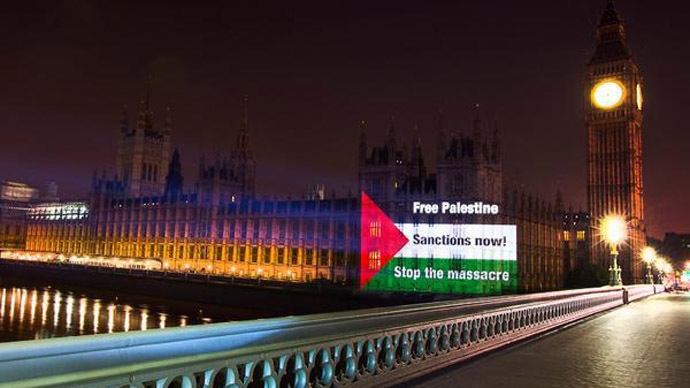 Most recently on July 26, an estimated 45,000 people rallied in support ofPalestinians outside the Israeli Embassy in London, and subsequently marched on to Britain's parliament buildings. In the close of her letter to Hammond, James requested the government rethink its policy toward the Israel-Palestine conflict, of which the ongoing Gaza crisis is the latest phase. “The scale of suffering in Gaza is far too great, the loss of life, and particularly the lives of children and other vulnerable individuals, cannot be justified on the grounds of defense in proportion to the level of threat faced by Israel from Hamas,” she said. Other MPs and even ministers agree with her assessment of the ongoing military operation. One minister told Channel 4 News presenter Cathy Newman off the record they were “really disheartened” by Hammond’s apparent unwillingness to upset Israel. 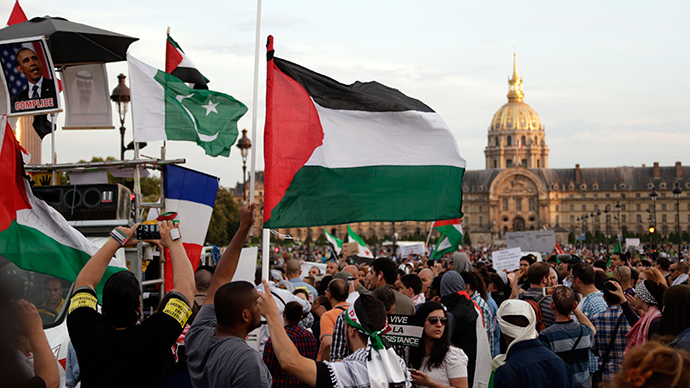 Newman said James’ letter showed that the UK government’s policy on Gaza was being strongly questioned. “Bear in mind James has just been appointed parliamentary private secretary to William Hague, who left the Foreign Office only a few weeks ago, and you get a sense of the pressure building on the government,” Newman commented in her Channel 4 blog. RT called the office of Margot James on Friday to inquire whether William Hague shared her deep concerns about the government’s current stance on the Gaza crisis. MP James was abroad on government business, and her parliamentary assistant, Georgina Treacy, declined to comment. On the question of whether Ms James’ call for a government policy shift on the Gaza conflict was widely supported within the Tory’s ranks, Treacy was unable to specify. Since becoming Foreign Secretary, Hammond has criticized Israel’s Operation Protective Edge, stating it has undermined Western support for the Middle Eastern state. But he has failed to condemn the brutal offensive as disproportionate. RT called the office of William Hague on Friday to inquire whether frustration with Hammond’s failure to acknowledge the IDF’s alleged disproportionate use of force was widespread within the Conservative party. Hague was unavailable for comment. The foreign secretary has repeatedly emphasized Israel’s right to defend its national security, while calling for an immediate end to ongoing violence in the region.